Derma-stamp/roll to thicken very thin under-eye skin? Hello, I am interested in purchasing a product to thicken my under-eye skin. The questions here on under-eye skin seem to relate to crows feet or bags. I don't have either (YET) - my problem instead is that while the rest of my skin is normal thickness, the skin under my eyes has always been extremely thin, to the extent that my veins have been visible there, even from a young age. Is it safe to use your derma roller or derma stamp (and between the 2 which would you recommend for this area?) on the delicate under eye skin area (especially considering it's even MORE delicate /thin under-eye skin than average) or are there risks that I could permanently damage it, and assuming it is safe, do you think I would get results if I stamp / roll on this skin, for the exclusive purpose of THICKENING the skin, as opposed to removing wrinkles or bags? Many thanks in advance. Re: Derma-stamp/roll to thicken very thin under-eye skin? The thickness of the skin varies depending on where it resides. The skin on the upper and lower eyelids is the thinnest skin on the body and there is also almost no fat in that area. That is why many people have "dark circles" under their eyes because the underlying tissue such as veins and the orbicularis oculi muscle shine through the thin skin. In addition, because there is not much fat between the skin and the muscle, the dark muscle absorbs the light and that makes the area optically darker. When you treat the skin under your eyes, pull the skin down (away from the eye) with one hand and roll or stamp with the other. You can use both a dermaroller or a dermastamp around the eyes. They both thicken the skin. 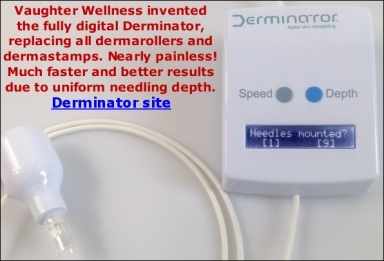 For your purpose, buy a 0.5 mm dermaroller or a 0.5 mm dermastamp. To thicken the skin, you have to use it for many months (up to three times a week). When the tool gets blunt, you can even go for the size 1 mm with your next one. Many thanks for your comprehensive reply. Ive only recently discovered this site, and you are v helpful.